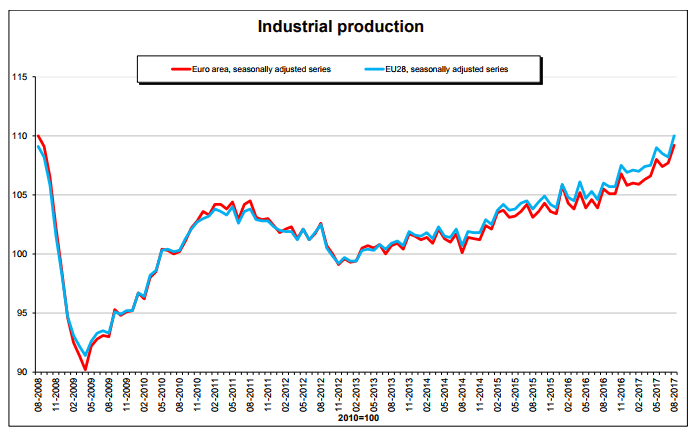 In August 2017 compared with July 2017, seasonally adjusted industrial production rose by 1.4% in the euro area (EA19) and by 1.7% in the EU28, according to estimates from Eurostat, the statistical office of the European Union. In July 2017, industrial production rose by 0.3% in the euro area, while it fell by 0.3% in the EU28. In August 2017 compared with August 2016, industrial production increased by 3.8% in the euro area and by 3.9% in the EU28. 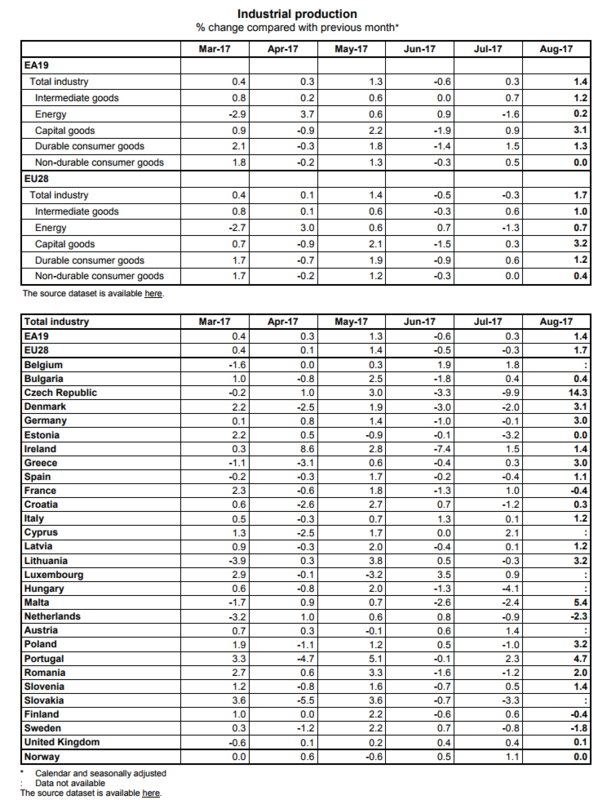 The increase of 1.4% in industrial production in the euro area in August 2017, compared with July 2017, is due to production of capital goods rising by 3.1%, durable consumer goods by 1.3%, intermediate goods by 1.2% and energy by 0.2%, while production of non-durable consumer goods remained stable. In the EU28, the increase of 1.7% is due to production of capital goods rising by 3.2%, durable consumer goods by 1.2%, intermediate goods by 1.0%, energy by 0.7% and non-durable consumer goods by 0.4%. Among Member States for which data are available, the highest increases in industrial production were registered in the Czech Republic (+14.3%), Malta (+5.4%) and Portugal (+4.7%). Decreases were observed in the Netherlands (-2.3%), Sweden (-1.8%), France and Finland (both -0.4%). 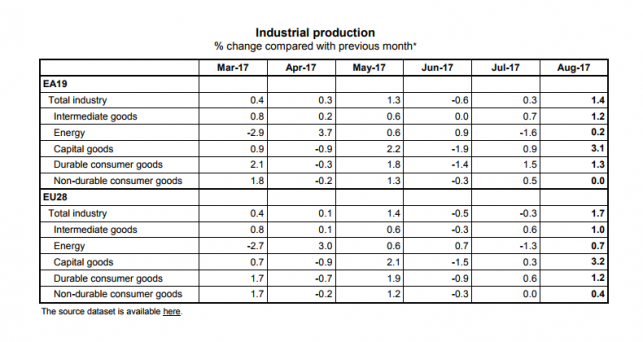 The increase of 3.8% in industrial production in the euro area in August 2017, compared with August 2016, is due to production of intermediate goods rising by 5.3%, capital goods by 4.9%, durable consumer goods by 3.6% and non-durable consumer goods by 2.4%, while production of energy fell by 0.7%. In the EU28, the increase of 3.9% is due to production of capital goods rising by 5.5%, intermediate goods by 5.3%, durable consumer goods by 3.6% and non-durable consumer goods by 2.3%, while production of energy fell by 0.4%. Among Member States for which data are available, the highest increases in industrial production were registered in Lithuania (+13.1%), Latvia (+12.1%) and Romania (+10.3%). A decrease was observed in the Netherlands (-1.8%).